ALL TRUST ABOUT MISTERIOS CAMERA T.S.V.V.S. 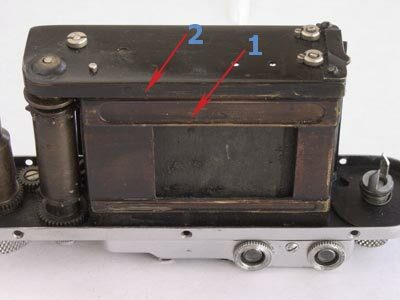 Many collectors of the Soviet cameras often asked a question - where camera "TSVVS" has been made. 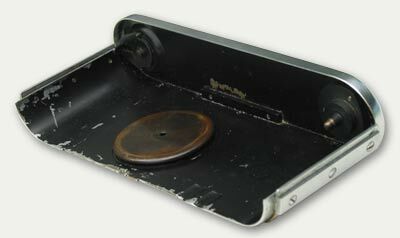 Happened that only few know a history of occurrence of the mysterious camera, and where it has been made. And such paradox has explanations which can easily dispel mysterious curtain. 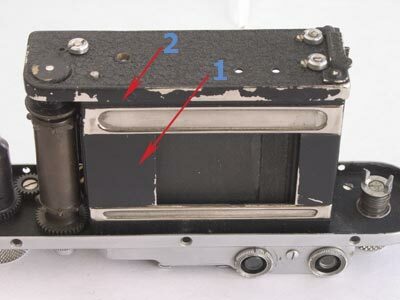 The reason of secret connected with this unique camera consists in the manufacturer who has given a life to the camera. 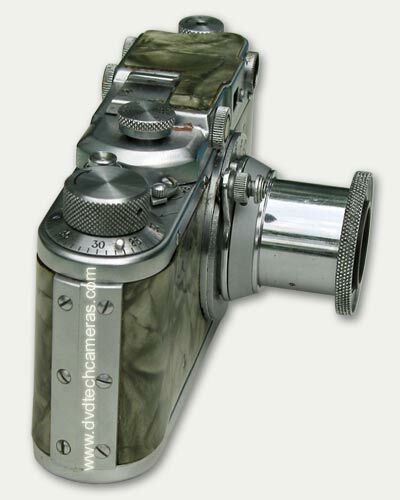 Yes, really, the manufacturer - the main originator of lack of the information on the camera. 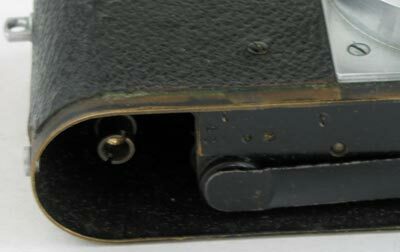 I've never heard, that someone from collectors had the instruction and the passport for mysterious cameras "TSVVS". 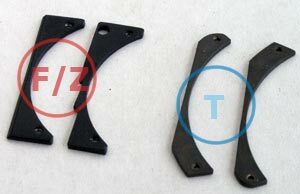 Even if marvellously someone has these documents, you will not find out the address of the manufacturer there. 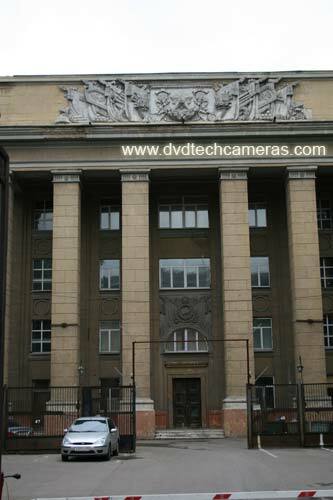 The manufacturer of cameras "TSVVS" is the confidential military factory "ALMAZ" ("Diamond") .And here is the answer on our question.Also if to take into account that these cameras have been made during the same period with the first rockets of a factory everything comes into an order. Now there is some information on the factory. 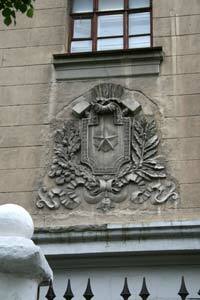 Building of a factory "ALMAZ" was started on autumn of 1947 on surburb of Moscow on a place of village Vsehsvjatskoe. This huge construction of "Stalin" architecture which is on a fork of Leningrad's and Volokolam's highways impresses with the power and magnificence even now. This factory was one of the most advanced and strategic for that time. On this factory worked the best Soviet experts of that time. By accelerated tempo they introduced the military projects in defense of the country. Besides during the period from 1947 till 1953 this factory was full of German engineers and the scientists who have been taken out from Germany after war. I think their wits have played an important role in rocket production on "ALMAZ" during birth of a factory. The first project of the factory, as showdown, was the creation of jet controlled weapon "Comet" - system "air - sea".S.L.Berija ruled this project. The works begun in 1947 under the project have come to the end with successful tests of system already in 1951. In 1950 the design office has started creation of the Moscow antiaircraft - rocket system of air defence under the name "Berkut" ("Golden Eagle") (after Stalin's death the name have changed on С-25). The system should consist of the antiaircraft rocket complexes, placed by two rings on distances of 50 and 90 kilometers from the center of Moscow, and the multichannel radars placed on the same ring boundaries. This system has been made in extremely short time, for four with a half years. The first transported system of the controlled antiaircraft rocket weapon under the name С-75 was produced in 1958 . Complex С-75 "Dvina" and its updatings "Desna" and "Volkhov", capable to amaze the purpose at heights up to 25 kilometers, became the most widespread in the world. They were exported to tens of states, here and there are on arms even today. Perhaps, even now this complex cannot be surpassed by criterion " efficiency - cost ". Tests of antispace defenses system have been successfully lead in 1970 . With the help of this weapon the first artificial satellite has been destroyed in space. In 1979 complex of antispace defention has started fighting watch. The American satellites, figuratively speaking, appeared " on a hook ". By the way only in 15 years the American rocket "Srem-altair" has struck in space the first satellite - target. Unfortunately, it is not possible to list all developments and achievements which are connected with this factory and it's not our topic of discussion. It is necessary to note a number of the interesting facts concerning this factory. 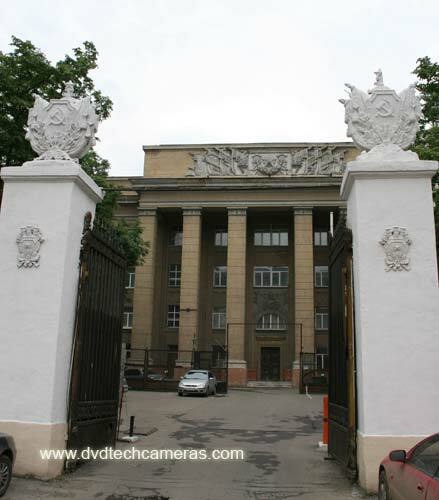 During the period sinse 1947 till 1953 on "ALMAZ" the post of the chief engineer was occupied by son of Lavrentiy Pavlovich Beriia (head national comitee of internal affairs of the USSR 1938-1945). During this period Sergo Lavrentievich Beria has also got a doctor's degree. The Beria-son took active part in creation and equipping the enterprise in the best way with inventory received during war in Land-Lisa. The enterprise had the enormous authority, it had up to 17000 workers. Recpectfull scientist - academician Alexander Raspletin has inheritted the place of Beria. 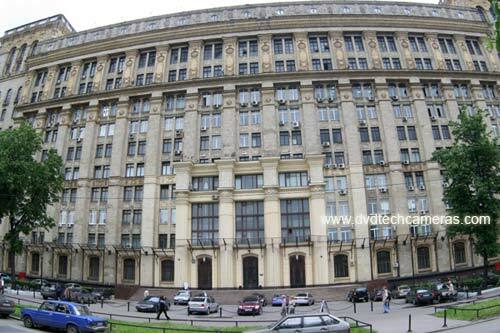 For last ten years number of workers on main institute "ALMAZ" has fallen up to three thousand, and now it's even less. 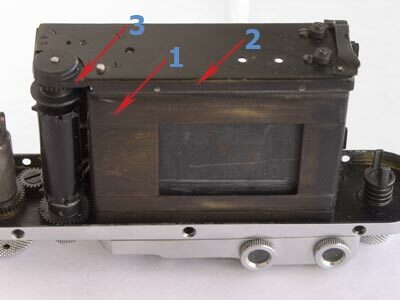 The factory "ALMAZ" and its personnel potential had no problem with creating "TSVVS" camera. 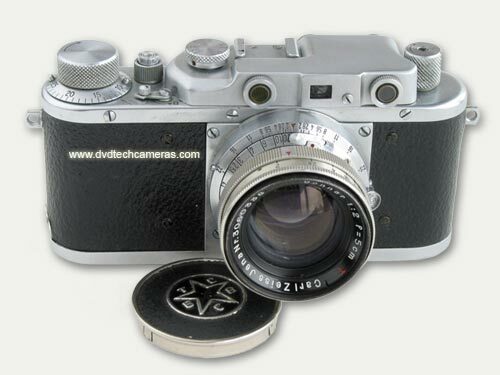 We should take itno account that then USSR had drawings for cameras FED, Kiev (Contax), so they had been immediately given in the using of the factory on the first inquiry. 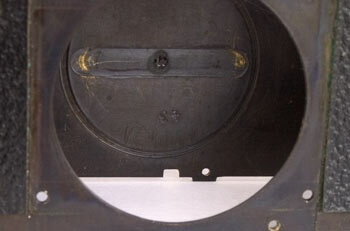 Possibly, not only drawings but leading experts were presented for creation of this camera. 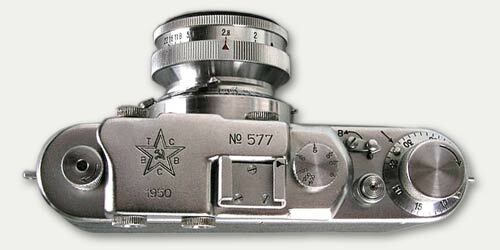 The camera had a better quality than Soviet cameras of that period- FED and Zorki. And it's not a wonder, because all the best in Soviet Union was made for our country defence. Now let's talk a little about the camera. 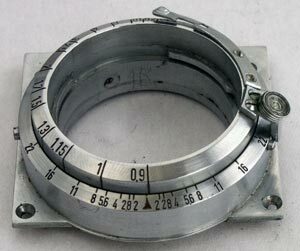 For the beginning we should understand the unusual name of the camera. Logically it is possible conclude that "TSVVS" are the capital letters of some words. I can assume that this name is deciphered as follows - Topographical Service of Military-Air Forces (TS Voenno-Vozdushnyh Sil). 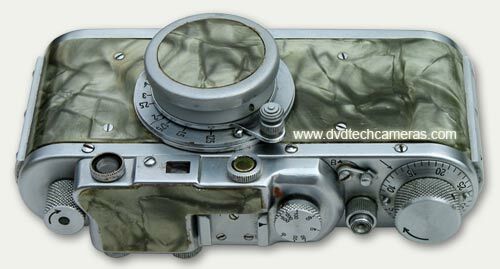 Likely this camera has been created for topographical shootings and should be supplied in air-force parts of Soviet Union. 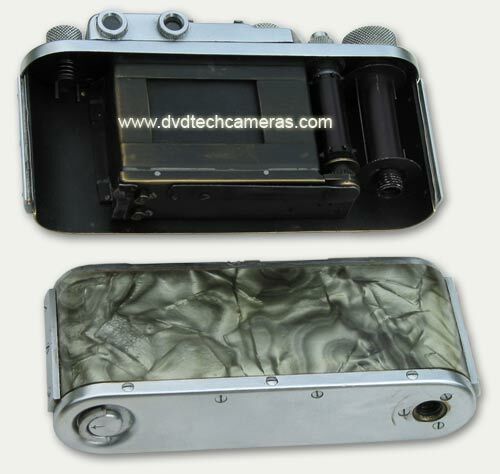 We can see a unusual design of the camera. 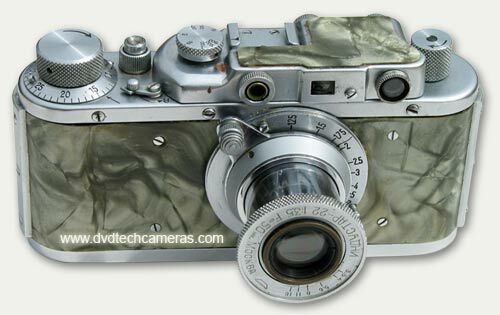 The camera FED was a basis for development of this camera, and fastening of an objective has been taken from another camera - Kiev (Contax). 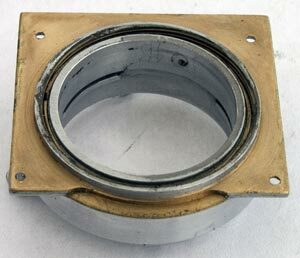 The lens Sonnar 2/50mm for "TSVVS" has been taken from German camera Contax which has been delivered from Germany in the post-war period. 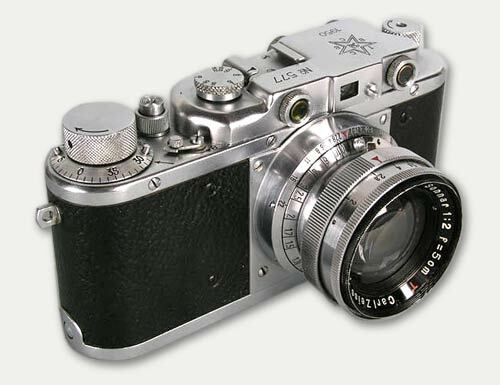 The factory "ALMAZ" even did not change the name of lens Sonnar as other Ukrainian factory Arsenal in the first years of the camera Kiev release did. It may be easily possible explained - the camera did not intend for civilians, so there was no necessity to change something. 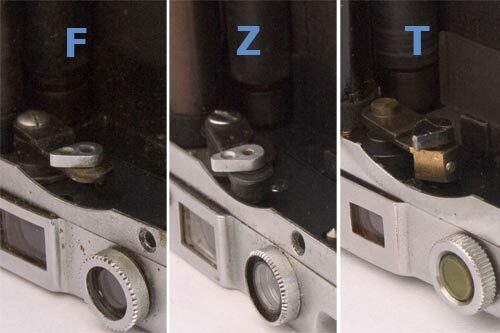 - An opportunity of fast replacement of replaceable lenses. Surely, these tasks were successfully executed by designers of camera "TSVVS". 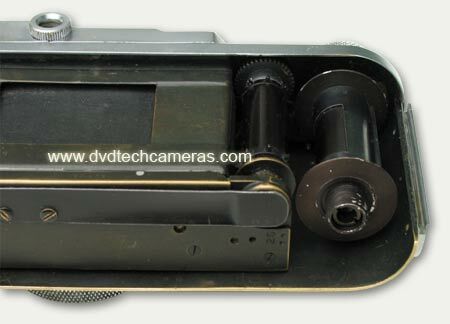 Unfortunately, the camera was never used on destination for topographical shooting of district. 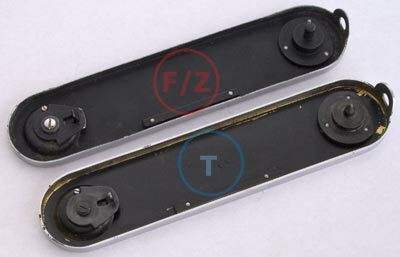 For this purpose the Air Forces used the special cameras which have been created for planes and had a number of advantages instead of "TSVVS". 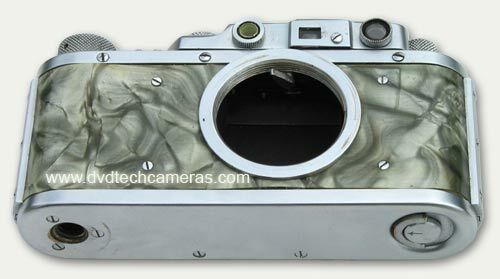 The factory has made a reserve for first party of cameras "TSVVS", presumably 1000 pieces. 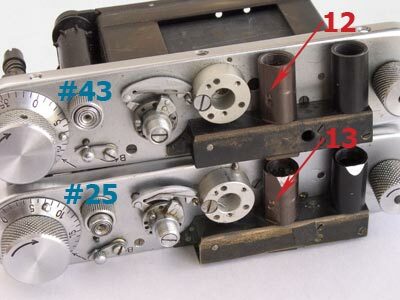 During 2 years: 1949 and 1950 - the factory made these cameras and completely used reserve intended for the first party.Subsequently administration of the "ALMAZ" decided take off cameras "TSVVS" from manufacture because of well-know for us reasons. It would like to note the following fact - with such industrial base the factory had magnificent prospects to reach the advanced positions not only in Soviet Union, but also abroad. As it was supposed earlier almost all party of the cameras has been distributed in military parts, exactly - in the Air Forces and air defence. 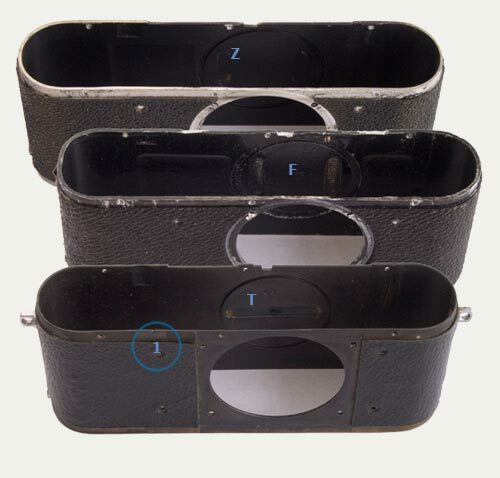 It seems to me that Antiaircraft Defense have received the great part of these cameras nevertheless (in the nearest future I will certainly determine with this hypothesis). As the cameras were not used to destination, appeared a decision to use "TSVVS" cameras as encouragement for officer and general structure. Facade of the main building of the factory. Last construction of 1953. One of entrances on a factory "Almaz". Passing double obstacle, you will get in the building. It is the building of early constructions, presumably 1947-48. Elements of architecture in military style which can be observed not only on a building but also on a protection of a factory. 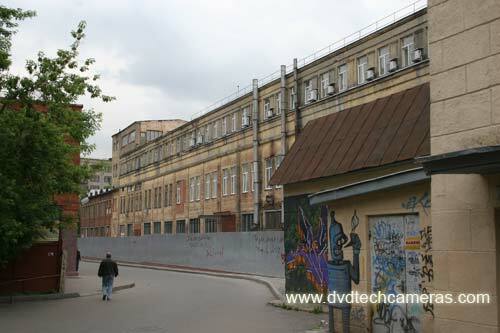 One of industrial buildings in which maybe the camera of TSVVS could be produced. 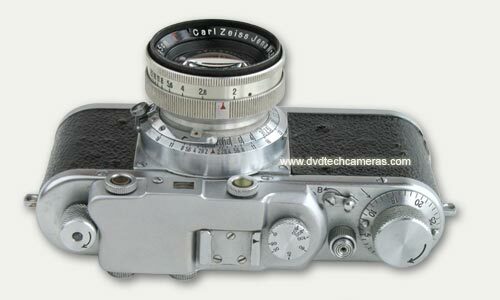 Camera is from the collection of Bill Parkinson from San Francisco, California, USA. ВСЯ ПРАВДА О ТАИНСТВЕННОЙ КАМЕРЕ Т.С.В.В.С. Многие коллекционеры советских камер неоднократно задавали себе вопрос - где был сделан фотоаппарат "ТСВВС". Так сложилось, что немногие знают историю возникновения загадочной камеры, и тем более, где она была произведена. И такому парадоксу есть свои объяснения, которые легко могут развеять таинственный занавес. Причина тайны, с которой связана эта уникальная камера, заключается в производителе, который дал жизнь камере. Да, действительно, именно производитель - главный виновник недостатка информации об этой камере. Я никогда не слышал, чтобы кто-то из коллекционеров имел инструкцию и паспорт для загадочной камеры "ТСВВС". Даже если на удивление кто-то имеет эти документы, вы не обнаружите там адрес производителя. Производителем камер "ТСВВС" является секретный военный завод «Алмаз». Вот вам и ответ на вопрос. Кроме того, если учесть, что эти камеры были произведены в один тот же период с первыми ракетами завода, всё становится на свои места. Теперь немного информации о самом заводе. Строительство завода "Алмаз" развернулось осенью 1947 года на окраине Москвы на месте села Всехсвятское. Это гигантское сооружение "сталинской" архитектуры, которое находится на развилке Ленинградского и Волоколамского шоссе, даже сейчас впечатляет своей мощью и великолепием. Этот завод являлся одним из самих передовых и стратегических на то время. На этом заводе работали лучшие советские специалисты того времени, которые ударными темпами внедряли свои военные проекты в оборону страны. Кроме того, в период с 1947 по 1953 год на этом заводе работали немецкие инженеры и учёные, вывезенные из Германии после войны. Я думаю, их умы в начальный период становления завода сыграли немаловажную роль в ракетостроении на "Алмазе". Первым проектом на заводе, как бы пробой сил, стало создание реактивного управляемого оружия- "Кометы" - системы "воздух - море". Руководил этим проектом С.Л. Берия. Начавшиеся в 1947 году работы по проекту завершились успешными испытаниями системы уже в 1951-м. В 1950 году конструкторское бюро приступило к созданию московской зенитно-ракетной системы ПВО под названием "Беркут" (после смерти Сталина название поменяли на С-25). Система должна была состоять из зенитных ракетных комплексов, расставленных двумя кольцами на расстояниях 50 и 90 километров от центра Москвы, и размещенных на этих же кольцевых рубежах многоканальных радиолокаторов. Эта система была сделана в фантастически короткий строк, всего за четыре с половиной года. В 1958 году вышла в свет первая перевозимая система зенитного управляемого ракетного оружия под названием С-75. Комплекс С-75 "Двина" и его модификации "Десна" и "Волхов", способные поражать цели на высотах до 25 километров, оказались самыми распространенными на земном шаре. Они экспортировались в десятки государств, а кое-где и сегодня находятся на вооружении. Пожалуй, и сейчас этот вошедший в историю комплекс невозможно превзойти по критерию "эффективность - стоимость". В 1970 году были успешно произведены испытания системы противокосмической обороны, с помощью которой в космосе был уничтожен первый искусственный спутник. В 1979 году комплекс ПКО был поставлен на боевое дежурство. Американские спутники, образно говоря, оказались «на крючке». Между прочим лишь через 15 лет американская ракета "Срэм-Альтаир" поразила в космосе свой первый спутник-мишень. К сожалению, не возможно перечислить все разработки и достижения, которые связаны с этим заводом, да и не наша это тема. Следует отметить ряд интересных фактов, имеющих отношение к этому заводу. В период с 1947 по 1953 год на "Алмазе" должность главного инженера занимал сын Лаврентия Павловича Берии (Нарком внутренних дел СССР 1938—1945). В этот период Серго Лаврентьевич Берия также защитил докторскую диссертацию. Берия-сын принимал активное участие в создании и оснащении предприятия лучшим оборудованием, полученным во время войны по Лэнд-Лизу. Предприятие имело колоссальный авторитет, на нем работало до 17000 человек. Берию сменил уважаемый ученый — академик Александр Расплетин. За последние десять лет численность работников главного института «Алмаза» упала до трех тысяч, а сейчас она еще меньше. Для завода «Алмаз» и его кадрового потенциала не составляло труда изготовить камеру "ТСВВС". Если учесть, что в этот период в Советском Союзе были в наличии чертежи для камер ФЭД, Киев (Contax) , то нетрудно представить, что при первом запросе стратегического завода, чертежи были немедленно предоставлены в их пользование. Я думаю, что заводу были также предоставлены не только чертежи, а возможно и ведущие специалисты для создания этой камеры. По качеству камера превосходила советские камеры того периода - ФЭД и Зоркий. И это неудивительно, всё лучшее в Советском Союзе производилось для обороны нашей страны. Теперь поговорим немного о самой камере. Для начала нам нужно разобраться в необычном названии камеры. Если следовать логике, то можно прийти к выводу, что это заглавные буквы каких-то слов. Я могу предположить, что это название расшифровывается следующим образом - Топографическая Служба Военно-Воздушных Сил. По всей вероятности эта камера была разработана для топографических съемок и должна была снабжаться в Военно-Воздушные части Советского Союза. Мы можем видеть необычную конструкцию камеры. В разработке этой камеры за основу была взята камера ФЭД, а крепление объектива было позаимствовано с другой камеры – Киев (Contax). Объектив Sonnar 2/50mm для "ТСВВС" был взят от немецкой камеры Contax, которая была завезена из Германии в послевоенный период. Завод «Алмаз» не стал даже менять название линзы Sonnar, как это сделал другой украинский завод Арсенал в первые годы выпуска камер Киев. Это легко можно объяснить - так как камера не предназначалась для гражданского населения, не было необходимости менять что-либо. - возможность быстрой замены сменных линз. Нет сомнений, что эти задачи были успешно выполнена разработчиками камеры "ТСВВС". К сожалению, камера никогда не использовалась по назначению для топографической съемки местности. Для этой цели ВВС использовали специальные камеры, которые были разработаны для самолётов и имели ряд преимуществ перед "ТСВВС". Заводом был сделан задел на первую партию камер ТСВВС, предположительно 1000 штук. На протяжении 2 лет: 1949 и 1950 - завод производил эти камеры и надо полагать, израсходувал все детали для первой партии. Впоследствии руководством завода «Алмаз» было принято решение снять с производства камеры "ТСВВС" по понятным нам причинам. Хотелось бы отметить следующий факт - располагая той производственной базой, завод имел великолепные перспективы выйти на передовые позиции не только в Советском Союзе, но и за рубежом. Почти вся партия камер была распределена, как и предполагалось ранее в военные части, а именно - ВВС и ПВО. Мне кажется, что большая часть этих камер всё же получили части ПротивоВоздушной Обороны ( в ближайшее время я смогу наверняка определится с этой гипотезой). В виду того, что камеры не использовались по назначению, было принято мудрое решение: использовать "ТСВВС" как подарочные камеры в качестве поощрения для офицерского и генеральского состава.